Mobile game developer and publisher Animoca Brands has announced the launch of Garfield’s Adventure on Android devices. The game stars the famous lazy cat, who drifts into a dreamland full of cookies and lasagna. Instead of paradise, however, Garfield finds himself being chased by a wall of fire, challenged with collecting as many tasty treats as he can before being captured. Garfield’s Adventure offers both endless and arcade modes, but the gameplay is the same in each. Players tap on the left and right sides of the screen to control the direction of Garfield’s movement, while Garfield runs automatically. The goal is to collect as many cookies or lasagna pieces as possible by falling in between platforms to continue moving down the screen. The screen is constantly moving as well, so players need to be fast to stop the fire from catching up with them. In the game’s arcade mode, play is split into different locations, each with different challenges (like muddy platforms, icy surfaces and more), and players collect cookies as currency. In endless mode, players collect lasagna and can continue to fall for as long as possible to earn the most currency. 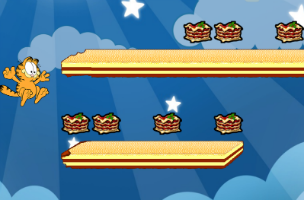 In between levels, this lasagna can be used to unlock additional arcade stages to continue the game’s progression. Cookies, meanwhile, are used to purchase a variety of power-ups for both Garfield and the overall game, as well as new playable characters like Odie and Nermal. One individual power may help the chosen character fall faster down the screen, while another increases his or her movement speed on sticky platforms, and so on. Other environment boosters may freeze everything in a stage, allowing players to move freely for a few seconds, or will see players instantly falling 250 meters with the help of an anchor (as examples). Garfield’s Adventure is available to download for free on Google Play. The game is coming soon to iOS devices.